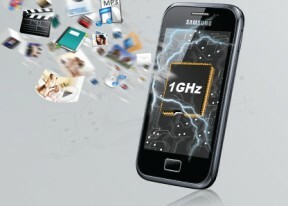 The Samsung Galaxy Ace Plus has quad-band 3G and GSM/GPRS/EDGE support, with 7.2 Mbps HSDPA. Moving on, there's Bluetooth 3.0 for fast local file transfers. Then there's Wi-Fi b/g/n support and a Wi-Fi hotspot option. The interface of the Android web browser has hardly changed. Its user experience is, as always, flawless. There's Flash 11 support, which means you can watch YouTube videos right in the browser (videos up to 720p worked smoothly) and play Flash games too. The Social hub we've seen before - it combines your email accounts with social networking (Facebook, Twitter, LinkedIn) and email accounts and shows all incoming messages on one list with handy shortcuts to reply, mark as favorite and so on. There's filtering by message source too, to help manage the inflow of incoming updates. The Samsung Galaxy Ace Plus features a decent alarm clock application with a huge number of alarms to be set, each with its own start time and repeat pattern. The Memo and Mini Diary are self-explanatory. The first app works with text only, while the Diary lets you also attach pictures. You also get a To-Do app called Task and a Voice recorder to round off the organizer functionality. The Galaxy Ace comes with the ThinkFree Office pack pre-installed - it's a document viewer and an editor combined. It works like a charm and is capable of pinch zooming. Both panning and zooming are fast and the overall performance of the office package is excellent. The Samsung Galaxy Ace Plus managed to get a GPS lock in just under a minute without A-GPS. A-GPS can speed up the lock (but it involves data traffic). Cell-ID and Wi-Fi positioning are also available if all you need is a rough location, but they need a data connection too. The Samsung Galaxy Ace Plus has the latest version of the Android Market - now called Google Play. The new name and icon aside there aren't major changes in the look of the app store. In select countries aside from apps you'll also find music, movies and books but this content remains limited so far. Upon launch of the Market app you're greeted with the tiled interface of the Featured window. A swipe to the right takes you to the Categories view. The Samsung Galaxy Ace Plus comes with Kies Air preloaded. The app connects to the local Wi-Fi network (or it can create a Wi-Fi hotspot) and gives you a URL to type into your computer's web browser.